The majority of hip dislocations are posterior and due to impaction of the femoral head upon the acetabulum from direct force to the distal femur (generally against a dashboard). This usually results in fracture of the posterior rim of the acetabulum and may result in sciatic nerve injury. With anterior dislocation, the femoral head is displaced into the obturator or pubic region. With internal dislocation, the femoral head projects into the pelvic cavity. 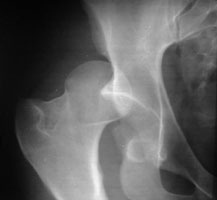 A AP radiograph of the right hip. There is posterior dislocation of the femoral head.